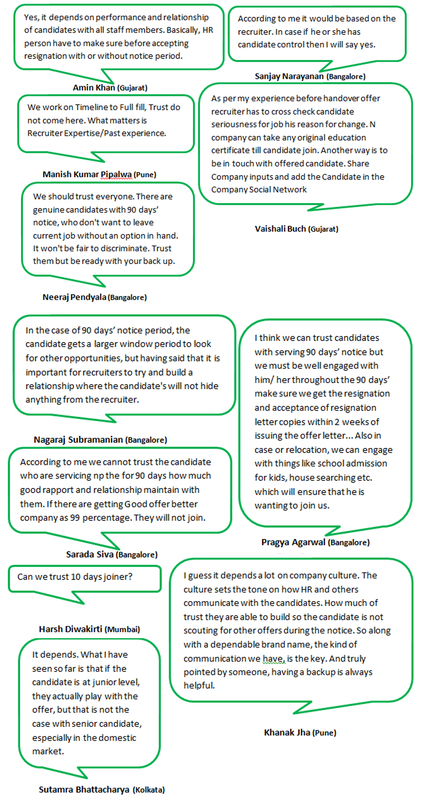 WhatsApp Group Chat – Can Recruiters trust Candidates serving 90 day’s Notice Period? Talent Acquisitionists constantly deal with Candidates serving their Notice Period, some Applicants even opt for the buy – out option for better Career prospects. 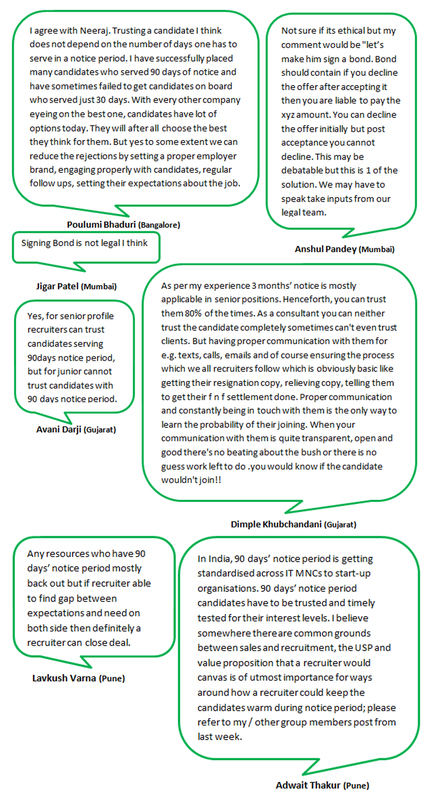 But the question still remains, “Can Recruiters trust Candidates serving 90 days’ notice Period?” even more so with digitalisation. Some even wonder whether they can trust 10 days joiner Candidates. You’ll come across genuine candidates with 90 days’ notice period, who aren’t ready to leave their current job without another option in hand. It’s unfair to discriminate between Candidates; you can trust them but you also need to be ready with a backup. In the case of 90 days’ notice period, the Candidates get a larger window period to look for other opportunities. There have been instances where Recruiters have had many Candidates who served their 90 days’ notice period but have sometimes failed to get Candidates on board who served just 30 days’ notice period. Remember that Candidates will always choose the opportunity that best meets their interest and their Career. Know that to some extent you can reduce the rejections by setting a proper employer brand, engaging properly with candidates, regular follow ups and setting their expectations about the job. A Candidate serving a 3 months’ notice period is mostly applicable in senior positions when you can trust them 80% of the time. The level of trust one is able to build and whether Candidates aren’t scouting for other offers during the notice. One need’s to have a dependable brand name along with the kind of communication one has is the key. HR Representatives need to make sure the Candidates are trust worthy before accepting a resignation with or without a notice period. Recruiters need to cross check the Candidates seriousness for Job and their reasons for change before handing over the offer letter. It is important for Recruiters to try and build a relationship where Candidate’s don’t hide anything from them. Recruiters can trust Candidates serving 90 days’ notice period but they need to engage with the Candidates well throughout their 90 days’ tenure. Ensure that you get the Resignation and Acceptance of Resignation letter copies within 2 weeks of issuing an offer letter. In case of relocation, Recruiters can engage with them by having a casual conversation about the school admission for kids if any, house searching etc. as it ensures that the wants to join your organisation. Making signing bonds compulsory may not be ethical; having a Bond that contains for instance the statement, “If you decline the offer after accepting it then you are liable to pay the xyz amount. You can decline the offer initially but post acceptance you cannot decline” may also be unethical. Know that this is a debatable topic and one which requires one to take inputs from a legal team which is essential but this can be a solution. Telling them to get their Full and Final settlement done with proper communication and constantly being in touch with them is the only way to ensure the probability of their joining. When your communication with them is quite transparent, open and good there’s no beating around the bush or any guess work left to do you’ll know if the Candidate won’t join. Any Resources that have a 90 days’ notice period generally back out but if a Recruiter is able to bridge the gap between expectations and need on both sides then they can definitely close the deal. 90 days’ notice period Candidates have to be trusted and timely tested for their interest levels. Candidates at the Junior Level actually play with the offer but that is not the case with a Senior Candidate especially in a domestic market. Some organisation work on Time line basis to full fill their requirements where trust does not come in to the picture but what matters is a Recruiters Expertise / Past Experiences. The highlights of the discussion above clearly portrays the amount of value addition you have in your learning and you realise exactly what your missing out on by not being a part of these informative discussions. Ensure that you follow us @SourcingAdda to gain real time updates to our upcoming events and activities. Send us a DM with your contact and location details to @SourcingAdda and one of our representatives will get back to you and we’ll accordingly to add you. In the meantime know that if you’ve read this then you’ve already added to your knowledge and you can know more by reading our post on Leveraging Technology into HR. The most awaited and exciting event of the year Talent Acquisition and Sourcing Conclave (#TASCON17) for Sourcing ADDA is back in action with preparations on and rolling. Having completed, two consecutive years of success with #TASCON15 & #TASCON16 now Sourcing ADDA proudly presents #TASCON17. Then again it seems like only yesterday we had conducted our first ever, one of its kind Talent Acquisition and Sourcing Conclave (#TASCON15) & then #TASCON16. And now we’re in the process of conducting #TASCON17. What an achievement wouldn’t you say? Although we’re preparing for #TASCON17 we are reminded of the same enthusiasm and excitement we’ve experienced previously while planning such events. This also brings flashbacks that are still very much engrained in our memories. With that said, isn’t it the perfect time to relive those precious moments that are now part of us and who we are altogether? The success of both #TASCON15 & #TASCON16 have taught each one of us that were present; something new and we can all proudly say that we’ve added to our knowledge and are now looking for more with anticipation for what is to come. #TASCON15 was held on 15th April 2015 (Wednesday) at Hotel Hyatt, Pune which helped Sourcing ADDA achieve another milestone. The event comprised of 19 renowned speakers from reputed companies with 150 attendees ranging from Directors, Heads, Managers, Executives, Sourcing, Recruiting and H. R. professionals. Similarly, for #TASCON16 which was held at Hyatt Regency, Pune on 14th April 2016 where we had 250 delegates and 30 renowned speakers and we’re planning to have it on a grand scale with #TASCON17 this time. We would like to take this opportunity to thank our #TASCON15 & #TASCON16 Sponsors namely, SourcePRO a Talent Sourcing Training & Certification Program, RippleHire and Gift XOXO for supporting us and making these events a success. So let’s find out more about these events and their success by taking a sneak peak in to what happened at these events. We had several activities to complement this grand event even the Sponsors joined in wherein the delegates enjoyed them. Some of these activities that we had at #TASCON15 were Tweeting, while we had #TASCON16 styles that were followed by individual & company group delegates. In both the events the common activities that were held were #SelfieContest and a Standee with the statement, “One thing you learnt today!! !” where they had to write something about what they learnt. This time we also conducted a Survey to understand the challenges faced by Talent Acquisition based on which the Topics for #TASCON17 were selected. Similarly we had activities conducted in the 2 sections i.e. Strategy Hub & Sourcing Lab. Unlike #TASCON15 where we had the Sourcing Mega Contest with 12 participants this time we hosted 2 Sourcing Premier Leagues (SPL) with 6 winners from both SPL 1 & SPL 2 who gained entry to the Mega Sourcing Premier League competing with each other including 2 surprise Wild Card entries that brings the total to 8 participants for this League. Similarly we’re having a Pre- contest where 10 winners will be chosen to compete at #TicketToTASCON17. To get a glimpse and a sense of what we’ve accomplished or achieved so far you’ll have to find out by joining us at Talent Acquisition and Sourcing Conclave (#TASCON17) now even grander with double the fun. You’ve got to experience it first – hand by catching all the action live and enjoy while you add to your knowledge and bloom into better Talent Acquisitionist’s then you were before. WhatsApp Group Chat – How to Identify if a Candidate Joins or Simply uses the Offer? Most Talent Acquisitionist’s have encountered cases where they’ve had Candidates not joining the Organisation even after having given the Offer Letter. There have been several instances where Recruiters have realised that Applicants have merely used the Offer for better job opportunities. But the challenge still remains on how to combat this scenario. Notice the signs (the red flag) i.e. when the candidate tries to buy time by giving excuses like “boss is out of the country or will return in 2 weeks” etc. Check their Naukri and Monster profiles; if they are constantly viewing their profile then it’s an indication that they are still on the lookout. Post offer released ask them to remove their profiles from the portal since most Candidates receive calls from such portals. If the candidate is serious and satisfied with the offer in hand then they’ll listen and remove their profiles from such portals. If a Candidate applies for a job 2-3 months prior to the actual appraisals which for most companies are in December or March; they are more likely offer – shopping for a counter offer from the current employer. Secondly, pay close attention to the hesitation in their tone when answering a critical question i.e. “reason for change” as it’s a big clue that they are more likely offer shopping. Could share few technical problem statements and solutions that the team performed (of course without client / confidential / classified material); get the candidate’s view / alternate approaches. Some candidates who work in top MNCs have the habit of going for an interview to get an offer and ask for a hike in such a scenario a company should ask them to leave or else the Offering Company should ask for the Resignation acceptance e-mail. What to do to improve the offer to joining ratio? Keep them engaged by sending e-mails pertaining to the company and highlight where their contribution would lie e.g. a simple line like ‘you can contribute to our business in the XYZ space’ helps. Recruiters should not only engage them but keep the candidate’s interest by sharing company happenings and other information related to the job responsibilities as it’ll keep the candidate active and interested. Once the trust is built; even if the candidate wasn’t sure to take the offer, you’d have at least had the satisfaction of having a shot at convincing them. Try to in – still a sense of confidence to the candidates that we are there to help and guide them so most of the time they’ll open up. Beyond the offer you also need to build healthy relationships by sharing your personal experience & views meaning personal and not professional engagement. Best practice that works is close the offer @ lesser amount than budget and keep some margin in hand and conveys to the candidate that you’re trying your level best to get something extra for you. Choose an appropriate time to reveal the amount in order to maintain good personal relations and gain the trust of Candidates. If a potential employee has approached the company with the end goal of obtaining a better offer from another company, such people should be identified up front and the measures to engage them should be taken accordingly. Try to connect with the prospect on a more personal level as this might have different results since we’re into the Human Resources. It’s important to monitor whether your protocols really work and to understand up to what extent they work. Ensure that you consider the salary package making it a very important factor that shouldn’t be missed as your offer needs to meet their salary expectation if it’s realistic. We can push the candidate to share the resignation in their current organisation immediately after making an offer. After all its business and it’s all about building relationships besides Recruiters should also rely on their own intuition and stop sharing C.Vs. of Candidate drop outs. Most Candidates don’t always work for money they work for treatment & good work environment hence be sure to treat them well. There is no correct method for the question in discussion because one may be motivated to join the company based on the rapport that you built. On the other hand someone might join your company anyway irrespective of the rapport build which will differ from case to case basis. This is more of a challenge with JN to mid – level candidates whereas SN level candidates are comparatively open and clear. There are a number of activities we can perform however no method can assure you a 100% accuracy. Note that there are candidates who block the company in that case you won’t be able to see their profile in Naukri or Monster but other company consultants can view their profile. 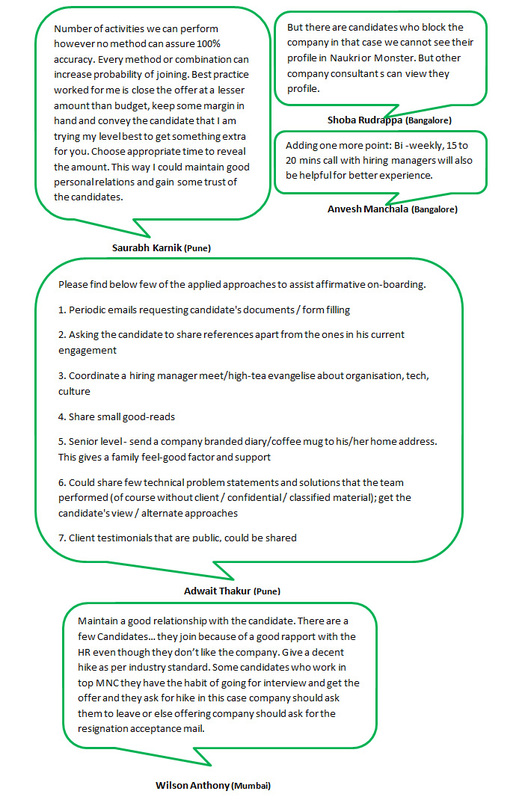 These are some of the key take a ways to bear in mind when dealing with Candidates on the whole. And paying careful attention to the cues you receive upon your interaction are indicators that will help you identify what’s the real reason the Applicant is coming for an Interview. More importantly learn to accept certain facts to move on and as far as possible be professional about it and avoid sharing candidate C.V. when they don’t join. Remember that if they don’t get back to you it’s because they’re keeping their options open which is perfectly alright. If you’ve read this far then you’ve found something you like and you realise what you’re missing out on by not being part of these groups. If you’d like to join these groups then be sure to leave your views or requests to join these WhatsApp Groups in the comments section or send us a DM @SourcingAdda with your details (location & WhatsApp. No.) Be sure to follow us to get real time updates to our upcoming activities and events. WhatsApp Group Chat – Whose Responsibility is Offer Drop? There has been a long standing debate about responsibility & accountability within the corporate environment and we’re quite familiar with the blame game. There are several reasons as to why people engage in the blame game one of the many reasons being either insufficient information due to lack of clarity in ones duties and responsibilities. Is offer drop the responsibility of the Recruiter or Recruitment Team? A good deal of responsibility lies with the recruiter and the concerned department lead but sometimes despite our best of efforts some candidates back out. As far as responsibility goes it should be the Recruiter and Recruitment Team as they are engaging the applicants. Offer Dropout is a produce of Lack of Candidate Engagement which includes the selection process, pre and post offer expectations setting and post offer interaction. People fail to understand that a consultant is just as good as an employer since they don’t look for the candidates only for the closure and to earn money. When retaining a candidate or approaching one serving their notice period with another opportunity which is financially or role wise a better one than what they are already holding they will consider the new opportunity. Communication is a major aspect as sometimes a Candidate gives a different picture but portrays something else at the interview, which we aren’t aware of. Sometimes when the Candidate knows about the CTC offered for a particular position, they obviously start close to that even if they are drawing almost 50% less than what is allocated. Even after setting and understanding the expectations, the time period sometimes is so long, that the expectations and situation of the Candidate changes or is lured with something better than what they currently have. The luring at times convinces the Candidate that what they have in hand is not as per their aspirations. To be on safer side it’s advisable to have 2 candidates in pipeline; one you can offer while you keep the other as a backup. Then if the first Candidate backs out normally the business agrees to increase the budget to avoid wastage of time. 90% of the decision made by candidates while accepting an offer more often than not compensation is the main factor. Candidates get hints of onsite opportunities from current employers or hear word of immediate ones from another company. All you can do is make the person feel valued if it will ensure that they at least inform you in case they decide not to join. Realise that’s it’s the Candidates market so in spite of your efforts it’s their career and life’s decision and you cannot put a price on that besides they are in charge. Irrespective of your efforts in convincing Candidates it rolls down to their mind set at the end of the day. When engagement is right there would be a bond and when there’s a bond there’s nothing called informing. If you reach out to Candidates serving their notice period, you have to accept and face the fact that someone else may reach out to ours. Realise that most Candidate will not tell you exactly what they are looking for or the reasons for them it’s up to you to pick up the hints and clues based on observation and expressed behaviour. From the HR perspective we can set up rules but from the on business front people will not agree since candidate will become bill able resource and delivery will be most important thus everyone will break the rules for survival as businesses are billable. Businesses need to accept risks as well hence accepting the risk of a Candidate dropping out at last minute is unavoidable. Unless we stop pursuing already offered candidates then we will have drop outs. Candidates know that they become valuable while serving notices and they exploit that importance which is probably human nature. Send candidates who don’t respond for more than 2 weeks after the offer rolled out a withdrawal of offer email with a cc to the business partner and the consultant; and the candidate will respond to the email for fear of being blacklisted. A candidate is less likely to drop out if the Recruiter guides them on how the opportunity would help them to advance in their career which goes a long way in building trust. Understand and act accordingly with candidates instead of pushing them around in the name of chasing targets. Just a call or two from the business to the new candidate before joining makes the candidate feel like they are valued and the organisation is looking forward to them join and works for senior level hiring. Roping in the hiring Manager to conduct connect calls as a part of the post offer management process makes a difference. Involving their ex co-workers, referrers engaging their personal factors in our discussions especially the emotion buttons are the key. You may not be successful in changing the mind set of Candidates but as one industry you can surely set few rules to be followed by every organization which is similar to the no poaching policy. Well this brings our enlightening discussion to an end where we can say for certain that it was quite a discussion with a lot of key take away pointers to add to your knowledge and think about. So if you aren’t a part of these live discussions for instance Bell Curve Performance Management System a boon or bane? Then you now know what you are missing out on. Therefore, be sure to follow us @SourcingAdda for real time updates to our upcoming events and activities. In the meantime make sure you leave your views or requests to join our WhatsApp Groups in the comments section or DM (Twitter) us @SourcingAdda with your contact no. & location and our representative will get back to you.